To say that Ijahman Levi is a deeply spiritual man would be an understatement. This is a man who lives his life in the Scriptures. For Ijahman, life is a constant fulfillment of prophesy. In the new book, Bob Marley: Songs of Freedom (Viking Studio), there is a compelling photograph of Jacob Miller, Bob Marley, Ijahman Levi and Junior Marvin sitting at the 1979 Sunsplash beach party. Ijahman and Bob Marley were friends. This is not something which Ijahman mentions in conversation, but it was none-the-less the case. Ijahman sees visions of Bob Marley when he sleeps at night -- when his spirit walks. "In my peaceful rest, it's like a slice of death. Somewhere over there, I'm with my friends in the spirit." That vision, chronicled in "Bob and Friends Over There," continues to haunt Ijahman Levi. Bob Marley was mummified like Joseph in Egypt, he says. "The spirit want to be free. Him don't feel him fully free, until him go back ashes to ashes and dust to dust. The Earth is the lord and the fullness thereof. So it is in the beginning, so shall it be in the end. "Bob spirit want to be free but it cyan't until the flesh go back to the Earth. If you cyan't respect life, you cyan't respect death, if you cyan't respect death, you cyan't respect life. "Who is Bob, a Pharaoh? Release Bob. Take him out of the sepulcher where him in now. Put him in the Earth. Haffe release de mon (so he can) go talk to him Father." Ijahman Levi was born in Christiana, Manchester, Jamaica as Trevor Sutherland in 1946 (under the sign of Gemini). He grew up in Trenchtown. The young Sutherland had all the same dreams and aspirations of any ghetto youth in Trenchtown in the 1960s. "In Jamaica when we were all growing up by age fourteen, fifteen, sixteen; that's when all these guys (were) getting into their vibes like Joe Higgs, Alton Ellis. Music is in your blood. You just automatically want to rally around these singers. My idol was Joe Higgs. He was my idol. I just loved the way he looked -- the way he sing. He was a Rastaman at the time -- long, long, dread. And he was black and beautiful, mon, and I really admire this Rastaman. And he was a damn good singer. You know I rally around him in Trenchtown and try to sing -- me and my little partner. At the same time Bob was there on Second Street, I was on Third Street." Ijahman's musical aspirations involved many talent contests and auditions, the results of which were not always encouraging, but an early encounter with a soon to be infamous Anglo-Jamaican producer would inspire him to continue his struggle to succeed in music. "I remember once. . . there was an audition going on. Just like Bob Marley and all these guys used to go around Beverly's and go round Coxsone and go round Duke Reid and want a break. Desmond Dekker, Alton Ellis, Jimmy Cliff, the whole lot of us. I heard that there was an audition by a white man name Chris Blackwell. And this person (conducting) the audition was Jackie Edwards. Jackie Edwards was the one who was playing the piano -- audition all these artists for Blackwell. And I went and sing a song for (him) and he liked my voice and he put me through to see to Mr. Blackwell. So I went in and I sing a song for (Blackwell). It was my very first white man I had seen. So I sing my song, as young as I was twelve or thirteen, I sing this song to him, and he said (that) I have a lickle voice, and one day I will sing (but) I must go home and practice. I went through the door with that in my blood. I sing for this white man, and he didn't throw me out, he didn't put me down. He said my voice is just not ready yet, and I must go and practice." While Blackwell and Ijahman would not always see eye to eye in later years, that experience propelled the young singer to continue his quest when he joined his parents in England. "I leave Jamaica in 1963. My mother and father migrate back to England -- for work. They send for me as their one son. Before I leave I made one 45 for Duke Reid at the age of 16 -- a song name 'Red Eyes People.' The only time I've heard that song is when it was played back in the studio. "I went to England. I get a group together without knowing A from B. I get my first group together called the Vibrations. It was the time when the Beatles had 'I Love You, Yea, Yea, Yea' (sic), so it was an irie time. "My idol was Otis Redding. Anything Otis Redding sing, I sing, (and) at the time I look like him cause I was a baldhead at the time. He was my idol. I love Otis Redding, even now." The young Trevor Sutherland sang for several years with his partner Ian who eventually left for America. Ijahman recalls the transition being very difficult after his partner left. "I was still inexperienced, still learning. When you sing with somebody for so many years and then all a sudden you got to be a one-some, it's not easy." Ijahman would be a solo artist from the late 60s onward. He recalls that it was impossible to perform strictly Jamaican music, as audiences responded better to American soul. With his inherent love for Otis Redding and Motown, he obliged by covering tunes by Redding, Sam and Dave, and of course, Wilson Pickett's "Midnight Hour." The most formative experience in Ijahman's life was his time in prison in England which encompassed most of 1972 through 1974. He talks about the circumstances regrettably but with the reconciliation of time. He says the incident involved his first wife and some other people. He was charged with resisting arrest and two differnt counts of bodily harm. "When I went in, that was as Mr. Sutherland. When I went in prison, that's where I put my name together as Ijahman, not Levi, just Ijahman. I start reading my Bible. Trying to get (into) myself towards my God, finding myself. You know, Tribulation. I realize I'm a Levi cause of the month I am born. When I came out my family left me. I had to start over." The experience is the subject of his most recent album Two Double Six 701. The title comes from his prison number. Ijahman returned to Jamaica after leaving prison to "recharge my energy (and) my spirit." All the time, he kept reading a chapter a day of spiritual nourishment from the Bible and came to learn "who is a Levi and what is a Levi. Then I went back to England and did my first song 'Jah Heavy Load,' and that's where my whole life changed and started over again as Ijahman Levi." "Jah Heavy Load" was definitely the breakthrough song -- the beginning that every successful artist has. Dreams, as Ijahman states several times "are when your spirit walks outside the body." This is crucial to Ijahman's perspectives. "One night I went to my bed and I had a vision and it was Psalms 21. And I wake up in the morning. It was a Monday morning 1975 in January. And it was the 21st of January. And I receive a letter from a gentleman name Mr. Harris from DIP label." 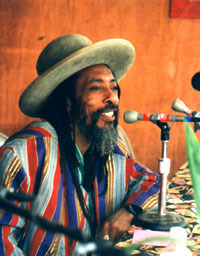 Considering this to be a sign, Ijahman pursued the lead, and recorded "Jah Heavy Load" as a single which was eventually released on the Concrete Jungle label. He recalls the session which produced the legendary song was a long and difficult one. He had resisted recording "Jah Heavy Load," but eventually decided to do it. "Once I released that 'Jah Heavy Load' from my system. Its pure melody start flowing out of my body." Circumstance was on Ijahman's side being in England at the time Chris Blackwell was having enormous success promoting Bob Marley and The Wailers. Blackwell heard the "Jah Heavy Load" single, and once again called on Ijahman, not remembering him from twelve years before. "I came one day in the office sitting down, and I was playing my guitar. In England now they started calling me 'ten strings.' So I've got my style. The Bible said 'play the instrument of ten strings.'" (Ijahman's ten string is a 12-string with the first small E-string and first small A-string removed). Blackwell was impressed, and he agreed to pay for production of an album in Jamaica. There, the sessions resulted in Hail I Hymn. "I laid down the four tracks to be a single and the four tracks end up being an LP. Rastafari. Hail I Hymn." After overwhelming critical acclaim for the effort on Hail I Hymn and its follow-up, Are We A Warrior (a Karl Pitterson mix), Ijahman and Island would run into rough waters. "It get very political, very deep," he recalls. The breakup resulted in a strange set of legal battles out of which Ijahman emerged with his publishing rights largely in tact. When questioned about the incredibly unlikely and essentially unique circumstances of his retention of rights after leaving Island, Ijahman breaks into a fierce laughter -- something he does with unmistakable charm. "I think Mr. Blackwell's words fall back on himself. I learn to lose things, seen. I lost my wife I lost my children. When Mr. Blackwell meet me, him meet me as an artist just becoming an artist, but a very bittered person. And no money in the world make me let go of what I have cause this is what I have. I have this one thing which is my talent, and I determine to hold on. It may look foolish at the time but I just hold on. Marcus Garvey told us in prophesy, 'Always mind what you sign.' Mind what you sign. I'm always very careful when it come to signatures." Contractually, Island didn't ever get Ijahman's publishing rights, but still sends him a bill every year for 74-thousand pounds for various expenses. Ijahman considers the notion ridiculous. "I've got 18 albums. Sooner or later, one day, Island will have to pay what they owe me." Ijahman takes an interesting attitude regarding Chris Blackwell and his dealings. While personally experienced with Blackwell's capitalistic tendencies, Ijahman is quick to acknowledge his role in creating Bob Marley. "He (Blackwell) has done a hell of a lot where reggae is concerned. Respect to Bob Marley and his talent, but it's half a dozen of one and six of the other. Bob Marley and his talent; Chris Blackwell and his money, and it work." After leaving Island, Ijahman struck out on the course of independence that would make his career so unique. Once again living prophesy, he claims he was bound to finish his first independent album, Tell It To The Children, by 1982. "I read prophesy and prophesy say, 'Anything you're doing, if you don't complete it in three and a half years, give up.'" And so it was that the Jahmani label was hesitantly launched. In the next twelve years, hesitation was not a problem as the label would account for a staggering fifteen albums, giving Ijahman a total of 18 completed works in 18 years -- an accomplishment unparalleled in reggae. "I've been working like mad," he states. During that time, reggae has seen drastic changes. Through it all, Ijahman has remained focused on Jah. "I've been around to see all the changes. I always just maintain this Ijahman. So it was in the beginning, so shall it be in the end. It's just a cycle. I'm just glad that when the cycle meet back again, I was glad to be here." Ijahman has worked with virtually every great session musician in Jamaica as well as his own band. His albums have featured Chinna, Sly & Robbie, Lloyd Parks, Bobby Ellis, Wire, Errol Nelson, Stephen Wright, Dwight Pickney, Chris Meredith, and the list goes on. "I and Jah work with all musicians that I choose to work with. I have to say, 'I choose,' because it is my production, and they work with me. Even though some of them is bigger than me in the world of music. I work with Sly and Robbie because they are damn good, but I couldn't work with Sly and Robbie all the time (because) my vibe couldn't change. Every one of my albums is a different album, because it's a different vibe at the time. And you can only express what is coming out of you." Ijahman has also had considerable musical success teaming with his current wife Madge. The duo released Ijahman and Madge in 1985 to massive reception in Europe. The single "I Do" was Ijahman's most successful since the time of "Jah Heavy Load." Europe, in fact, has always been the mainstay of Ijahman's success. For many Jamaican artists, success in Jamaica or Europe does not necessarily constitute success in the U.S., and 1995 will mark the first time that Ijahman has ever performed in the U.S., when he tours here this summer. With another prophetic justification, he explains the timing of his U.S. arrival, "If the mountain won't come to you, you might as well go to the mountain. So it's the right time to come to America." With success running his own label, one might expect Ijahman to produce other artists, but he has no such intentions, preferring to continue on his own. "I am building my catalog. I am working on Ijahman. I'm not interested in recording nobody else. It look selfish, it look one-mannish. But I just feel it to be that way. I'm just here with the time doing what I want to do. It's about pleasing Jah and pleasing the lickle people. "I always see myself as a loner . . . I can't help it. I'm just doing my own thing. I've reached a stage where if I care what people think, then I don't know what I want to do. I do believe with the ability I have that I do know when I am writing a good song from when I'm not writing a good song. I also know that it cannot please everybody at the same time. It can please some of the people some of the time. I just continue with what I am doing. "I know that word is power. Anything you sow is what you reap. I am in the spirit of Moses, cause Moses was a Levi. I know the forty days and forty nights will be over one day and I will haffa come back out with my rod." Ultimately an artist at heart, Ijahman says the truth remains in his music. To know Ijahman is to know his art. "If you listen to the music it really may help you more, becau the same man will talk to you. "I-man no change, I-man cyan change."